Working on a cabin in the deeps woods in Wisconsin has been quite an adventure so far. This last week was a bit of a milestone because it was the first site visit I’ve taken where the actual cabin is starting to take shape. According to the contractor, the whole thing will be done by the end of June, although the owner and I aren’t sure that will happen. If it does, I imagine I will be taking everyone out to dinner to celebrate – and I would be more than okay with doing that. This is the East elevation and is the approach to the house. I should point out (something that will become ridiculously obvious in a few more pictures) but this cabin is absolutely surrounded by trees – which I have removed from my model. I want you to see the building, not a suggestion of the cabin through a ba-jillion trees. This is the North Elevation – and the view of the cabin that will be seen from the owner’s adjacent neighboring property. In this view, you will approach from the left and the lake is on the right. This is the West Elevation and the side that is visible from the lake. It doesn’t get particularly hot here and the heat gain in the winter will be welcome. IN the summer months, the breeze coming in from the lake will every pleasant and all the windows shown above (except for the one in the bottom left-hand corner) are operable. For this visit, I brought Ryan with me – he has been working on this project almost as long as I have and is very familiar with the construction details. Since he is currently going after his architectural license, he gets to add up some job site visit hours. In the picture above, I was trying to get Ryan to back up so that I could throw a snowball into the tree branches and laugh as he gets avalanched … I probably shouldn’t have made the snowball in my hand quite so obvious, Ryan is clever enough to know that he shouldn’t do anything I am asking when I’m armed and loaded. In the end, He didn’t go for it and I ended up throwing the snowball into the chimney of the house where we were staying (which the clients also own and is right next door to their new house). Time to walk through the woods to get to the cabin … at least the snow will show me where the creepers are (and I think I could outrun Ryan). In this picture we are approaching the cabin on the terrace side. This will not be the typical approach as there is a deer trail off to the my right. I chose to go this way so I could get a different view of the cabin. In this picture, I have worked my way up the side of the drop-off and walked around to the edge of where the Deer path connects the two properties. This is the view that will be the majority of how people will see the cabin. On the ground floor level, right-hand side of this picture, is a covered terrace that is sheltered by the second story. On the upper floor, the two large square(ish) openings in the corner are a screened in porch, and the large opening rectangular opening on the left-hand side is one large expanse of windows. There are actually 4 windows that will be joined together – each one measures 8′-0″ wide and 5′-6″ tall. There are two steel columns that will carry the header that allows us to have such a large opening – you’ll be able to see those columns more clearly in a later image. In the picture above, I’ve survived climbing up an 16′ tall metal ladder that was completely covered in ice. We arrived on site after all the construction workers had left of the day so Ryan would have been the only person who would have seen me fall so my embarrassment exposure was fairly contained. You can see the covered terrace down below as well as the multiple steel columns that act as support and help provide a way to store the wood under roof but off the ground at the same time. Remember this firewood sketch? I am actually looking out of a large window in the Master Bedroom suite looking back towards the horizontal window in the kitchen. Finally … the 32′ long window that provides an amazing panoramic view out over the lake. Trust, me, there’s a lake out there, it’s just currently frozen and has snow sitting on top of it. You can look at this picture of the lake from one of my summer trips – I bet you’ll even be able to spot the configuration of the trees – they’ll be the same 3 trees you can see right in the center of this image. I should point out that the two half walls you see in this picture frame the stairs coming up from the lower level – you can get an idea of the view people will get when they arrive at the upper level. Here’s a slightly more close-up view … you can actually see the snow drifts out on the frozen lake. I’m told that at its thickest, the ice cap can freeze to more than 36″ deep. Apparently you can drive a car on the lake once you get above 12″. This entire cabin is built around the idea that this is a beautiful and peaceful place. In the summer time there are all sorts of birds (including Bald Eagles) flying around all the time. I’ve personally seen bunch of eagles and they truly are worth watching for an extended period of time. The opening in this image is to the left of the large panoramic window facing the lake. While I am a big fan of orienting a house towards the view, I am a big believer in that there needs to be other views as well. Since the clients entertain visitors almost non-stop, the view into the woods is extremely appealing, especially to those who don’t live up here year-round. Another large format window – this one is one the approach elevation. What you can’t tell from these images (because I didn’t take that particular picture) is the hose is slightly turned off axis from the drive approach. We wanted the occupants to look into the woods and not down the driveway. Rotating the cabin off this axis also keeps people who are driving up from seeing the entire cabin until they’ve arrived. Here’s that same window … notice Ryan outside the window? He’s taking the job site elevator up to the second floor (along with the client and the contractor). It might be hard to truly imagine what I am describing, the next picture should clear things up. You can see the “Ladder of Death” that I climbed up as well as the job site elevator. However, I will admit that I took a lift down, but only because it looked like fun. Let me assure you that we get snow in Dallas, just not with regularity. There is something about the stillness and quiet about being out in the remote woods watching snow fall – once you get past the idea that the woods could be filled with creepers, this is an amazingly peaceful place and I am looking forward to future wintertime visits. But back to work because during this trip the contractor was setting a 10″wide x 30″deep x 50′ long glum ridge beam. The day started off pretty early and getting in a 45 ton crane on site had its own challenges. Getting it set level was another matter. Can you see the front of the crane above is hovering about 3 feet above the ground!? Another view of the hovering crane. While it isn’t an issue, it was a little disconcerting to see. Before we could crane the 50′ glum beam into place, we (and by “we” I mean “the contractor”) had to scrap the ice off … which turned out to be a little harder than you might imagine. Eventually a torch had to be used to melt the ice and then scrap it off. It took about 30 minutes to complete a path down the beam … unfortunately, all the water that remained behind re-froze almost instantly so this process had to be repeated again. I don’t know if 50′ sounds al that big to you, but let me help put that in context. This is one. continuous. wood. beam. It was made and shipped in from Idaho and for those of you who are really curious, this beam (including shipping) cost around $4,000. If you look really, really closely, you can see the metal attachment brackets on the beam – there are three of them and they are the black rectangular items on the bottom side of the beam shown above. These are what will be used to weld the wood beam in place once it gets set atop steel columns. There was a lot of coordination between the contractor and the crane operator – access to the site is obviously limited and the reach on this crane was maxed out just a few inches further than we needed. What you are seeing in the picture above is a test run to see how close we can get to where we need to be. Once everything checked out, time to put the beam in place. Would you be surprised to learn that not a single branch was broken during this installation? I was – in fact at one point, I told the contractor that he was ruining my pictures. One the right-hand side of the beam show above is the rope guide. This rope tied to one end was the only measure put in place to help control the beam and it swiveled through the air. You can see the guy responsible for “guiding” the beam to the left. He didn’t actually seem to do all that much but I took that to mean that they were good at their jobs. If they were running around yelling and pulling like mad on that rope, that would probably have been a bad sign. Once the glulam beam was moved in to position, it was strapped off and then welded in place. The entire process from start to finish only took about an hour. Here is a close up look at the steel brackets that were installed on the glulam beam so that it could be welded to the steel columns. If you are wondering how I got so close to that bracket, where I am looking down at it (meaning no telephoto) is because I climbed up the icy “Scaffolding of Death” so that I could look at the welds. I am about 35′ above the frozen ground with a lot of things below to break my fall … things like “lumber”. I didn’t stay up there very long. I did stay up there long enough to take a look at the rest of the progress on the roof framing. Again, you can see the openings in the adjacent structure and the views they suggest. 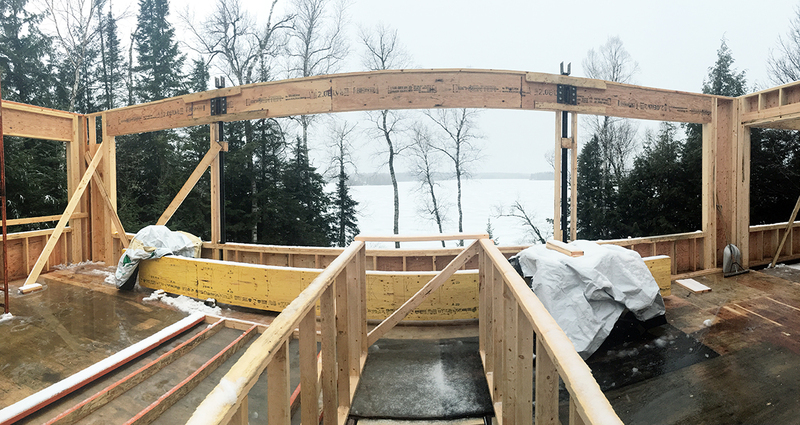 I took a panoramic photo from my perch on the scaffolding – I thought it presented a much better understanding of the density of the wooded area where this cabin will reside. You can click on this image and it will open up much larger in a new window. Finally I leave you with a Buster Keaton from “Steamboat Bill Jr.” moment I had flash through my mind when Ryan was casually walking away from the cabin as they were lifting the 50′ glulam beam in to place. I’m sure you’ve seen the clip somewhere before but it’s the movie when the entire facade of a house falls off and Buster Keaton is standing in the spot where a window exists and it’s the only thing that keeps him from getting crushed. I like Ryan well enough to travel with him for several days and I’m glad he wasn’t crushed … that would have put a damper on that evenings activities for sure.